Hope. This week's challenge from Laura Harms was making me think. I wasn't sure how to go about this one, but settled for simplicity. While making it I was thinking of those people with cancer in their lives (themselves or loved ones). Good healing thoughts went with every stroke of the pen. The tile was one that I added watercolor to a while back which was close by. I needed something easy to get to since my back went out today while working on cutting my garden down. I guess I was also hoping that my back would get back together soon. Yup, lots of hope. 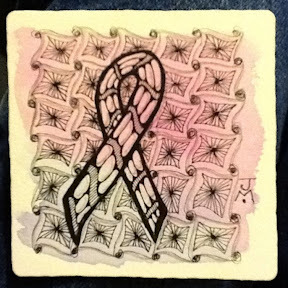 This tile is dedicated to friend and co-worker, Karen who is battling cancer now. Very beautiful! love the blush of color! I love the color and I love the quilted look behind the ribbon. So pretty.